It's always nice to see someone lay down some truth before the bubbleheads on Bubblevision. Former OMB budget director David Stockman dropped in this morning to say what we've been saying here for years: the Fed created the current mess, and Congress will never find fiscal responsibility as long as the Fed is monetizing its debt. Anyone who's read Confessions of an Economic Hit Man has to be a little suspicious of Hugo Chavez's medical condition. The U.S. government tried a coup against him once; does anyone doubt they would poison him if they had the chance? I'm pleased to say that I had caught on to U.S. imperialism in Latin America even before reading Confessions. Helps to have been there and seen it first-hand, I suppose. U.S. out of South America! An original film from our friend Charlie McDanger. Obama's disappointed white liberal fans meet his bitter black race-baiting fans. Hilarity ensues. If you haven't driven through Utah, please plan to do so. There's a reason the early Mormon settlers thought it was the Promised Land. Sandy police Sgt. Jon Arnold said evidence indicates that Beckie Boudreaux, 66, shot and killed her husband, Stephen Boudreaux, 69, and then turned a handgun on herself. "Our preliminary investigation does indicate homicide-suicide," Arnold said Tuesday. "There is no indication that Stephen was aware of Beckie’s plans or the financial struggles that appeared to be the motive behind Beckie’s choices." Arnold also said Boudreaux family members had found "documentation that indicated she had been researching this for several months." It wasn't enough for the ATF to arm the drug cartels with semiautomatic weapons. Nope. Obama had to bomb the crap out of Libya so terrorists could get their hands on 20,000 surface-to-air missiles. Yes, the kind that can shoot down commercial airliners. I loved Elizabeth Warren when she was fighting the dirty banksters. Now that she's just another authoritarian Obamunist running for Senate, I appreciate this mockery of her statist campaign (click to enlarge). Fifteen months into the Recovery Summer, and with crony capitalism and Fed FAIL featuring prominently in the headlines, I think it's worth revisiting this January post. Congratulations to our gay friends who now have the right to serve their country. Serial killer Alan Greenspan has been very active in the San Diego area this year. The bodies of a financially distressed 56-year-old Oceanside man and his sick 52-year-old sister were found in their home Monday afternoon in what police say appears to be a murder-suicide. The woman's black Labrador dog was also killed. Police did not release the names of the individuals and declined to give their relationship Monday night, as their relatives were still being told of their deaths. Three neighbors confirmed they were brother and sister. Oceanside police found the bodies shortly before 4 p.m. in separate bedrooms of their house near the end of a cul-de-sac on Via Metates, just east of College Boulevard. A gun was found in the room with the man, said Oceanside police Lt. Leonard Mata. ... where Paul Gigot says Chris Christie is seriously considering running. Look at the guy. He hasn't thought about running in his life. But I kid. I was thrilled to hear this because the current field is so weak. Rick Perry is an unprincipled, crony capitalist, loose cannon, and Mitt Romney is a liberal RINO who would coddle the big banks. I probably can't vote for any of the current field other than Ron Paul and Gary Johnson. UPDATED: Name redacted at request of subject. AP:"People are taking out $100,000 in debt and they're graduating next year," says [redacted], a 25-year-old MBA student at Northwestern University. [Redacted] voted for Obama in 2008 and remains a strong supporter. "I think he's doing the best he can in these circumstances," he says. That's not surprising. What is surprising is that an MSM outlet is reporting it accurately and without derision. If you don't support Ron Paul, you're implicitly supporting the false choice of liberal RINO Mitt Romney, faux conservative crony capitalist Rick Perry, and the love child of Jimmy Carter and Richard M. Nixon, Barack Obama. UBS just lost $2 billion and is blaming it on a "rogue trader" from Ghana in its London office. Sounds like a convenient guy to throw under the bus. Delta One products are a class of financial derivative that have no optionality and as such have a delta of one (or very close to one) – that is a 1% move in the underlying results in very close to 1% move in the derivative. They often incorporate a number of underlying securities and as such give the holder an easy way to gain exposure to a basket of securities in a single product. What should a union do when their company’s stock is trading at $1.58? Why threaten to go on strike over unfair working conditions and poor pay of course! As a strike deadline approaches, Air Canada is coming out swinging by telling flight attendants to buck up and accept the unpredictable nature of their jobs. “This departure from the routine is what makes the role attractive, and why we receive, on average, 25 applicants for every cabin crew member we hire,” Susan Welscheid, Air Canada’s senior vice-president of customer service, said in an internal letter to flight attendants. I brought my laptop to Minneapolis thinking maybe if someone broke into my house while I was gone (I do live in DC, after all), at least I'd have my laptop. I didn't plan on using it. In fact, I used it so little (read: at all), I forgot I had it in my bag when I tried to head back to DC from Minneapolis. 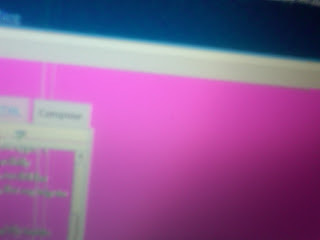 As of tonight, it's glowing green, the white parts of the screen are now pink and I can hardly see to type. I apologized to the TSO, who wasn't trying to mess with me when he pulled my laptop out and carefully examined my "Stop Bernanke" stickers. I couldn't possibly be a threat; I'm far too obvious to be useful for someone's covert mission to do anything. This is somewhat intentional, as the last thing I want is for my trip to be delayed because I forgot to be obvious in the airport. Obama: "If you love me, you've got to help me pass this bill." "I'm a fiscal hawk and I'm a big hawk on bank capital." - Tim Geithner being interviewed by Kramer the Klown on CNBC just moments ago (transcript, video). You mean like when you were head of the New York Fed, charged with Wall Street oversight, from 2003 - 2007 and you allowed all the TBTF banks to run wild with near-infinite leverage and bogus assets, Timmy? He also says there is "no chance" Europe will have a Lehman event. Hmmm... what was the last thing Geithner said there was no chance of? Oh yeah, that's right. The U.S. being downgraded. You know how Obama kept saying his plan was "bipartisan," how it was chock full of Republican ideas, and how it was time to put politics aside and "pass this bill immediately?" Yeah, here's the "bipartisan" details. You can now add "crony capitalist" to all the other things you've been calling Obama. The Global War on Terror is over. Though George W. Bush for his own reasons denies that he's won, it's over. And it's over thanks in large part to the aggressive measures Bush took after 9/11: tracking down terrorist financing, intercepting communications, and unleashing military and intelligence teams around the world. And Guantanamo. Thank God for Guantanamo. Khalid Sheikh Mohammed sang like a canary after a little waterboarding. If you don't love waterboarding, you're not paying attention. It is a remarkable achievement that we have not had another organized terror attack on U.S. soil in six years. How hard would it be for a few Islamist nuts to put together an Oklahoma City-style truck bomb? Or send a couple dozen suicide bombers into shopping malls in a simultaneous wave of attacks across America? Or even set off a dirty bomb in a big city? Our big dumb government "anonymously" leaked a report that there are terrorists among us (U.S. citizens even! ), and the lapdog media duly licked its master's hand and played along with the fear-mongering. This is a no-lose proposition for the government. If something bad happens on Sep. 11, they can say, "See? We told you so!" If nothing at all happens, they can take credit for being vigilant and protecting everyone. I wonder, what exactly is everybody commemorating tomorrow? The day our government was issued infinite power over individual rights, and a blank check to go bombing? Tomorrow will fill us to the brim with homages to America's indomitable spirit and tributes to our heroism and resilience; meanwhile the government will carry on fondling our wives and children, reading our email, and encouraging us to report one another. A Homewood woman died Thursday shortly after injecting heated beef fat into her face, but the injection, the latest in a series, did not cause her death, authorities said. An autopsy Friday determined that 63-year-old Janet Hardt died of peritonitis, a severe abdominal inflammation caused by a bacterial infection, according to the Cook County medical examiner’s office. Infections in her face from the injections did not lead to her death, which was ruled natural, officials with the medical examiner’s office said. A short time before Hardt died, she injected heated beef fat into her face around her mouth and chin, a procedure she had done before on several occasions, according to a source. Hardt had infections in her mouth and lip as well as scarring from performing the injections “for some time,’’ the source said, adding that she previously had multiple facial surgeries. The Associated Press wrote a disturbing account regarding the ILLEGAL actions of a bunch of union members who believe that the law of the land gives them the right to work at the facility that they illegally damaged. The article does its best to avoid claiming the actions of the union members are actually illegal. Let's take a look. San Diegans were spared listening to Dear Leader read from the teleprompter again about how we need hundreds of billions in stimulus "infrastructure" again. We're experiencing a countywide power failure that is expected to last until tomorrow. This is a good test run for the coming zombie apocalypse. If you don't have food, water, flashlights, batteries, bullion, and guns and ammo, this is your final warning. The W.C. Varones Blog is up and running on two massive, gasoline-powered generators, and will keep you informed of developments. Bloomberg: Perry’s First Debate Solidifies Frontrunner Status. It does? For fun do a word search on the page for Ron Paul. He's mentioned exactly 0 times. He was there right? I even think some thought he won. Well at least on Yahoo and MSNBC's polls he did. But BillyTG on Motley Fool comments on that:...see how the mainstream media polls of the debate show Ron Paul winning by huge margins, but the graphical representations try to downplay the margins by which he won! **This MSNBC poll shows Paul getting 47% of votes versus 20% for Romney. If you graphed that, Paul's bar should be nearly 2.5 times as long as Romney's right. Check out MSNBC's chart! 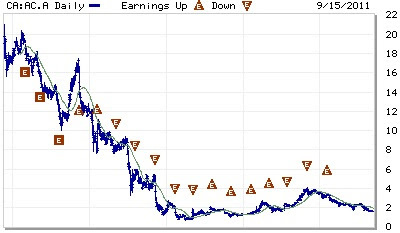 Good thing their financial charts don't look like this!!! Former Cy Young award winner Mike Flanagan died of a self-inflicted shotgun wound to the head, the Maryland medical examiner ruled Thursday. A police investigation revealed the 59-year-old pitcher was upset about financial issues. He left no note. Flanagan's body was found Wednesday afternoon about 250 feet behind his home. An investigation showed he was home alone when he took his life. Flanagan earned a good chunk of change as a baseball player even though he played before the multi-million-dollar roid-rage days. And he still had a good job as a broadcaster. So to have had financial troubles, he must have been enticed, in Greenspan's easy money party, to take on enormous debt either for conspicuous consumption or for silly business propositions. For decades, the Swiss Franc has had a reputation of quality and stability, as the Swiss could be counted on for sane fiscal and monetary policy (not to mention a refreshing lack of entanglement in foreign military quagmires). No longer. Swiss Franc Collapses 7% - Swiss National Bank to Fix CHF to EUR and Debase Currency. [...] the Swiss National Bank has decided to fix the country's exchange rate at 1.20 Swiss francs per euro. The SNB indicated it would buy an unlimited amount of euros regardless of the risk to maintain that value. [...] The SNB said in a statement that it "is prepared to buy foreign currency in unlimited quantities." Mr. Romney's people see Mr. Perry as a dopey Texas barbarian. Mr. Perry's people see Mr. Romney as Northeastern, elite, effete and opportunistic. You knew reading the WCV was fun and informative. But did you know it could be profitable, too? We take care of our readers. Click here and get a Citi credit card that will give you $100 just for taking the card and spending $500 on it. Better get it quick before the FHFA takes Citi down for dumping fraudulent mortgages on Fannie and Freddie. In GD II you'd be crazy to pass up a free $100 for filling out a 60-second credit card application. 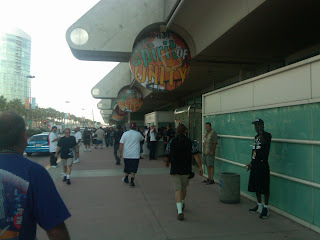 There's a bunch of halfwits in San Diego for a convention called "Spirit of Unity." Hard to tell if it's a religious cult or Obamunists. Happy Anniversary! 803 Ida celebrates 4 years on the market. A big congratulations to our friends at 803 Ida in Solana Beach on their fourth anniversary on the MLS. We first covered 803 Ida back in 2008 when they were asking $995,000, down from $1.2 million earlier. Then on their second anniversary, they were asking $899,000. Two years later, and they are at $749,000. Just wait until 2013 and you'll be able to pick it up for $600,000. Unfortunately, all that time on the market hasn't been kind to the building. The Redfin agent notes that it "could use a little TLC." 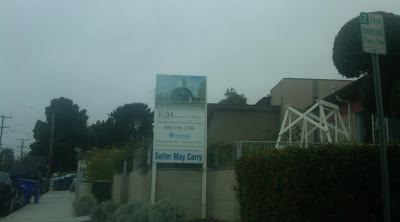 In other news of misguided Solana Beach condo developers, remember 140 - 146 N. Rios? These glue-sniffers were trying to sell strip-mall-view condos for the same price as nearby big, beautiful, ocean-view single-family homes. Well, that didn't work out so well. Three years later, they're still trying to sell them at the same asinine prices. This morning we noticed a friend-of-a-friend's post on Facebook, regarding George Lucas and his hatchet job on Star Wars. Haha! Funny friends this guy has...and his other friends pat him on the back for it. It almost reminds me of a post about George Lucas that appeared a day earlier on Tyler Durden:Very obviously George Lucas is a complete moron who simply lucked his way into this franchise because there were talented people around him and everything good about the first two movies were someone else’s idea that he hated but the studio made him use. I’m amazed we even still have James Earl Jones on here, and that Lucas didn’t replace him with Eddie Griffin or someone like that, so Darth Vader can say things like, “where my big girls girls at?”What a striking coincidence! It would seem that either Sean is a personal friend of the guy who runs Tyler, or he's a thief. This obviously doesn't rise to the level of a Carlos Mencia theft, but it's still pretty pathetic. Too much laggard teabagging pessimism and ignorance around here. How's that Hope and Change working out for you?